Last Friday, downtown Baltimore saw the first food truck "Gathering." Held in a small lot on Central Avenue just north of Eastern, the event is believed to have attracted a couple thousand folks eager to sample the wares of SouperFreak, Gypsy Queen Cafe, Chowhound, Creperie Breizh, Icedgems, Miss Shirley's, Silver Platter, GrrChe, Dangerously Delicious Pies, and the Haute Dog Cart. Unfortunately, when Mr Minx and I arrived at the lot, it was raining and quite sloppy. We decided to buy some grub and take it home to eat around our dry dining room table. I chose not to take photos of the event, because it was too awkward to manipulate an umbrella and a camera, but this rather vertiginous video gives a pretty good idea of the festivities. 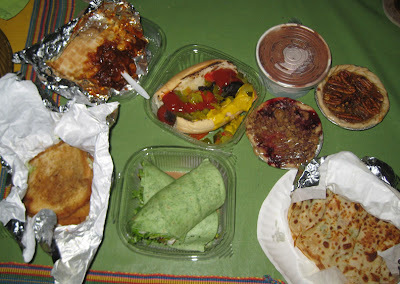 I had been talking about the food trucks for months now, and Mr Minx was eager to try items from my favorite vendors. I was also eager to try Creperie Breizh, which so far has not visited the UM area because of the prohibitively large size of their truck. The crepe we tried (bottom right) was the Parisienne, filled with baby spinach, bacon, Swiss cheese, tomato, and raspberry vinaigrette. The portion was large - a bargain at $6 - and even an hour after purchasing, when we were finally able to tuck into it, impressed us with its lovely flavors. I hope to encounter this truck again and enjoy a crepe while its still hot off the griddle. We sampled two of my favorite food truck offerings, Gypsy Queen's fish "po' boy" and SouperFreak's grilled asparagus and goat cheese wrap. Mr Minx chose two others: GQ's mac and cheese cone, and SF's Souper Dog, a spicy sausage with all of the usual toppings. And I couldn't resist the chocolate berry love soup which was blissfully good. We also got to try a couple of Rodney Henry's Deliciously Dangerous Pies, in sour cherry and pecan. Definitely delicious, but at $5 a pop, mostly dangerous to the pocketbook. Despite the rain, we thought The Gathering was well worth the effort and look forward to the next one. I'll be posting date and location here as soon as I find out!